The combination of extremely strong and sophisticated materials, together with Grivel's advanced technology lie behind the realization of this crampon which leaves all other models on the market far behind. Ten points in contact with ice while your walking and twelve that bite into the slope during traverses. Designed for ski touring, competitive ski mountaineering, classical mountaineering routes and for high altitude or distant expeditions where weight is the determining factor. 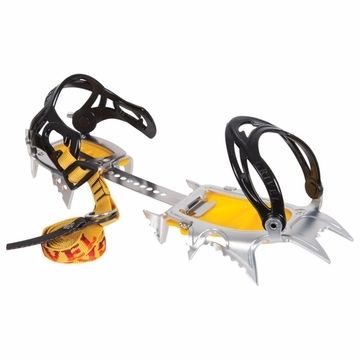 This model comes with Flex Bar which allows the foot free movement without over stressing the crampon. Weight: 476 grams 16.79 oz.